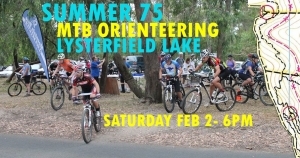 Come and try Summer 75 MTBO in one of Melbourne’s most popular MTB riding areas! Lysterfield Park is popular with riders of all experience levels as it’s filled with a fantastic range of trails. The courses have been designed so that there are plenty of controls for those not wanting to head too far away from the assembly area but for stronger riders looking for a bit more of a challenge, there’ll be lots of options for you too! Riders will all start sometime between 6:00-6:15pm and you have up to 75 minutes to visit as many controls the supplied colour map as you can. You choose which ones to visit and which way to get there, then get back to the finish before your 75 minutes is up. Each control you visit scores you 20 points but for every minute that you’re late after the 75 minutes is up, you lose 10 points so it becomes pretty exciting and tactical near the end. Don’t worry though, there’ll be lots of friendly helpers on the day to help you plan out your route and get the hang of the navigational side of things. Register on the day up until 5:45pm before the starts from 6pm. Enter Lysterfield Lake Park from Horswood Road and follow signs to parking (-37.966125, 145.302947). Entry is just $12 for adults and $6 for under 21s. We have food and drinks available after the event so please stay around after your ride and chat with others about where you rode!